Webcams are kinda boring. Most of them just look like a camera. But now there is this a striped tiger with a webcam in his belly. Just plug this webcam into your computer and you are ready to go. The camera is 4 megapixels and that is plenty for most of you video chatting. You really wonder why people buy those boring ugly webcams when you can have a plush tiger one. Give us a roar and check out this Plush Tiger Webcam. 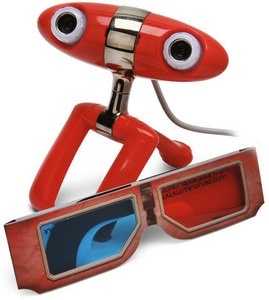 3D is the buzz word and now you can join the buzz with this 3D webcam made by Minoru. You can now videochat or make youtube video’s in 3D the camera of course will do 2D to but 3D is the future. The Minoru Web Cam even comes with several sets of 3D glasses so that your friends can start enjoying you in 3 dimensions. Go read all the fact of the Minoru 3D Web Cam. 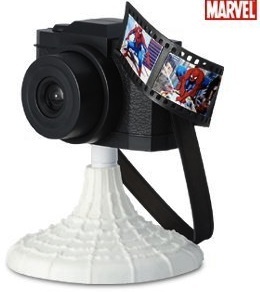 Spiderman fans now you can have a nice looking webcam to show you to your friends and Spiderman to you. The base of the camera looks like a web and the camera looks like a SLR camera with film coming out of it and on that film you see Spiderman. Check out this Spiderman Web Cam. 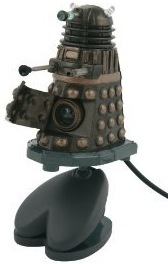 Dr. Who would be happy to see that you have a Dalek webcam with build in Microphone. This Webcam is cool and much cooler then most camera’s out there. the base is a clip so that you could clip it to your laptop or something like that. Unfortunately it only works with Windows so I am out of luck. Rovio will be your next best friend. 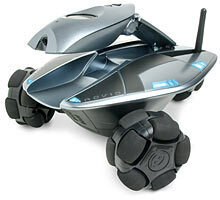 The Rovio is a little robot that can drive through you home or office and you can control it from anywhere. You can use Rovio to keep an eye on your home for instance to check if the mail came or to see how you dog is doing. But Rovio can do more because of it’s build in microphone and speakers you can communicate. Imagine you are on a business trip and you want to say hi to your kids and see what they are doing, it is possible with Rovio. Always wanted your own Enterprise? Now you can own your personal Star Trek space ship but then as a webcam that you can have on your PC or Mac. The webcam can be clipped on to your screen with the Star Trek Badge and connects to a USB port. Great for video chatting in MSN, Skype, iChat an much more.